This 1944 era children's picture book leaves children out of the story altogether, and intead explores the frustrations of a husband and wife at odds with how things should be around their home. 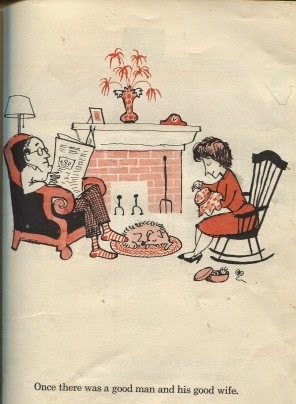 Once there was a good man and his good wife. They lived in a beautiful cottage. 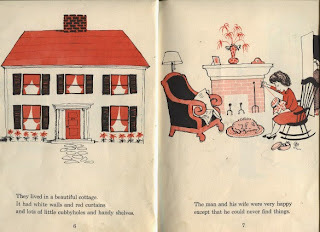 It had white walls and red curtains and lots of little cubbyholes and handy shelves. The man and his wife were very happy except that he could never find things. 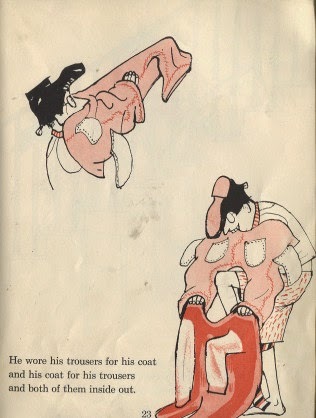 He would look for his shoes, and he could not find his shoes. He would look for a book, and he could not find the books. 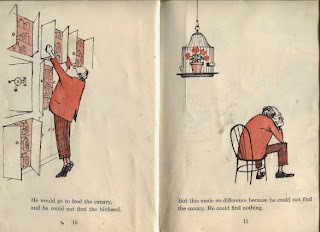 He would go to feed the canary, and he could not find the birdseed. But this made no difference because he could not find the canary. He could find nothing. Then the good man would say, "This is ridiculous!" He would walk up and down the room and shake his head and say very loudly, "This is ridiculous, indeed!" But it was not his fault. 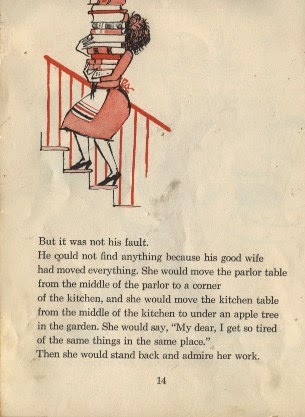 He could not find anything because his good wife had moved everything. She would move their parlor table from the middle of the parlor to a corner of the kitchen, and she would move the kitchen table from the middle of the kitchen to under an apple tree in the garden. She would say, "My dear, I get so tired of the same things in the same places." Then she would stand back and admire her work. She moved the good man's Sunday clothes from the closet in the hall to the closet in the attic. She moved the clock from the wall above the bed in the bedroom to an end of the mantelpiece in the parlor. She moved his favorite chair from its place before the fire to a corner of the bedroom. She moved everything in the little house. She said, "Yes, yes, I do get so tired of the same things in the same place!" and smoothed her apron contentedly. Then the good man had to learn things all over again. But by the time he learned to find his fishing rod in the broom closet next to the pantry and the birdseed in the cubbyhole under the stairs, everything was changed again. Then he looked very stern and cried, "This is ridiculous!" again. He decided to do something about it. 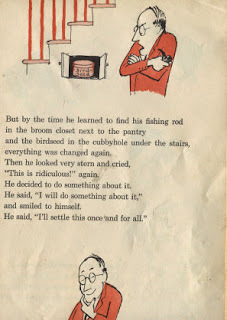 He said, "I will do something about it," and smiled to himself. He said, "I'll settle this once and for all." And he did something about it. He put his shoe on his head. He wore his garters around his neck. He tied his necktie around his knee. He wore his trousers for his coat and his coat for his trousers and both of them inside out. He wore his spectacles on his elbow. He wore his socks on his ears. Then he crawled downstairs. 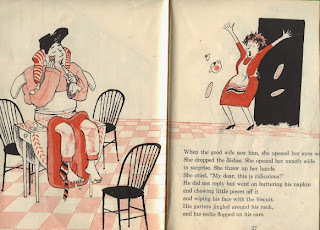 He sat on the breakfast table, ate his napkin and wiped his face on a biscuit. 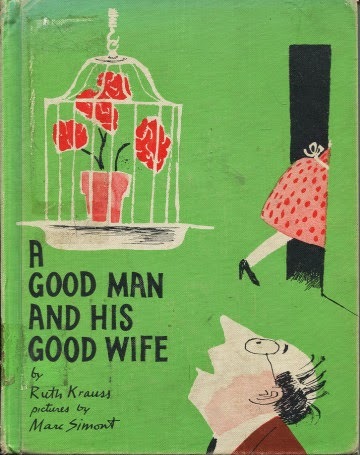 When the good wife saw him, she opened her eyes wide. She dropped the dishes. She opened her mouth wide in surprise. She threw up her hands. She cried, "This is ridiculous!" He did not reply but went on buttering his napkin and chewing little pieces off it and wiping his face with the biscuit. His garters jingled around his neck, and his socks flopped on his ears. And when she cried again, "But truly this is ridiculous, this is just too ridiculous!" he said very quietly, "My dear, I get so tired of the same things in the same place." And that was how the good man cured his good woman of a bad habit. 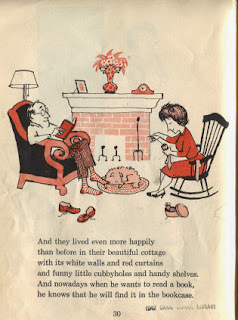 And they lived even more happily than before in their beautiful cottage with its white walls and red curtains and funny little cubbyholes and handy shelves. And nowadays when he wants to read a book, he knows that he will find it in the bookcase. I also have few books that I can't throw away because of the emotional attachment I have developed over the years for them. I might even give to my kids someday.